Viruses are infectious agents made up of proteins and a genome made of DNA or RNA. Upon infecting a host cell, viruses hijack the cell’s gene expression machinery and force it to produce copies of the viral genome and proteins, which then assemble into new viruses that can eventually infect other host cells. Because assembly is an essential step in the viral life cycle, understanding how this process occurs could significantly advance the fight against viral diseases. In many viral families, a protein shell called a capsid forms around the viral genome during the assembly process. Capsids can also assemble around nucleic acids in solution, indicating that a host cell is not required for their formation. Since capsid proteins are positively charged, and nucleic acids are negatively charged, electrostatic interactions between the two are thought to be important in capsid assembly. Current questions of interest are how structural features of the viral genome affect assembly, and why the negative charge on viral genomes is actually far greater than the positive charge on capsids. These questions are difficult to address experimentally because most of the intermediates that form during virus assembly are too short-lived to be imaged. 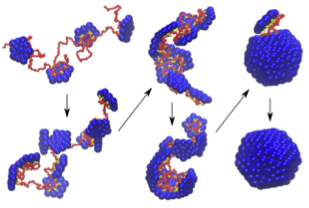 Snapshots from a computer simulation in which model capsid subunits (blue) assemble around a linear, negatively charged polymer (red). Positive charges on the capsid proteins are shown in yellow. In a new paper in eLife, Brandeis postdoc Jason Perlmutter, Physics grad student Cong Qiao, and Associate Professor Michael Hagan have used state of the art computational methods and advances in graphical processing units (on our High Performance Computing cluster) to produce the most realistic model of capsid assembly to date. They showed that the stability of the complex formed between the nucleic acid and the capsid depends on the length of the viral genome. Yield was highest for genomes within a certain range of lengths, and capsids that assembled around longer or shorter genomes tended to be malformed. Perlmutter et al. also explored how structural features of the virus — including base-pairing between viral nucleic acids, and the size and charge of the capsid — determine the optimal length of the viral genome. When they included structural data from real viruses in their simulations and predicted the optimal lengths for the viral genome, the results were very similar to those seen in existing viruses. This indicates that the structure of the viral genome has been optimized to promote packaging into capsids. Understanding this relationship between structure and packaging will make it easier to develop antiviral agents that thwart or misdirect virus assembly, and could aid the redesign of viruses for use in gene therapy and drug delivery. The Quantitative Biology Program at Brandeis University, supported by a grant from Howard Hughes Medical Institute, is now accepting applications for an award for preparing an outstanding set of three pedagogical lectures on a subject at the interface of the physical and biomedical sciences. These lectures will be given at the Quantitative Biology Bootcamp, January 26, through January 27, 2013. The award consists of a cash prize of $2,000. Any graduate student or postdoctoral research associate currently at Brandeis is eligible to apply. The application packet should consist of short curriculum vitae and a one page outline of the three lectures. QB faculty will work with the successful applicant in preparing the lectures. Applications should be submitted to Jen Scappini, (jscappin at brandeis dot edu). Due date will be discussed at meeting. 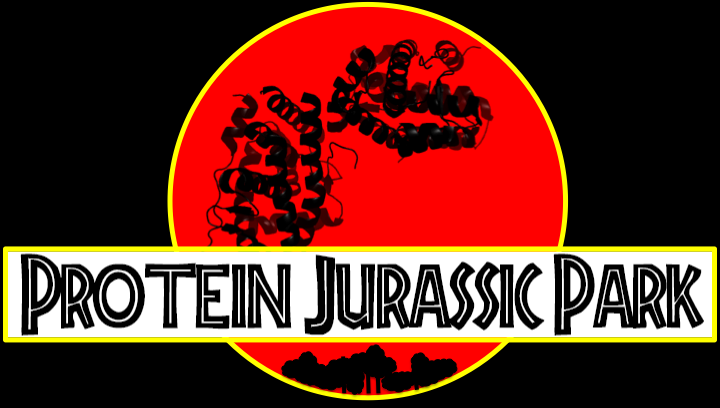 What do dinosaur DNA, calculating the global amount of carbon dioxide consumed in photosynthesis, and cooperation and cheating between yeast cells have in common? They were all topics discussed at the sixth annual Quantitative Biology Bootcamp, held on the Brandeis campus January 12 and 13. At the bootcamp, more than 40 Ph.D. students and faculty participated in lectures, discussions, and computational projects using both computers and pencil-on-paper approaches. The Brandeis Quantitative Biology Program is a unique “add-on” graduate program open to students in all six of the natural sciences Ph.D. programs at Brandeis. The main goal of the program is to train students to work effectively as a part of research teams that span the boundaries of traditional scientific disciplines. To this end, Quantitative Biology students participate in both courses and out-of-classroom activities, like the Bootcamp, that highlight the diverse approaches to scientific problems taken by scientists from different disciplines.